For the past year, I have been working for Jamie’s Notebook, writing various business blogs and newsletters. In contrast, for the past three years, I have been a full-time college student; before that, I was a full-time high school student. As you can imagine, I have had to write numerous papers for school, with topics ranging from a basic research paper to scientific research projects. And over the years, I have gotten really good at writing these types of scholarly, education-based papers. I learned the correct format for the papers, I learned how to conduct thorough research, and above all, I mastered the style of educational writing. When I was hired to be a content-writing intern for Jamie’s Notebook, the style of writing was completely different than I was used to. I had to adapt and learn a new way to voice the thoughts and ideas of the writing assignment. So, what’s really the big difference? For starters, some of the main differences include the tone, the words used, and the sentence structure of the writing. Is that all? In reality, how you write and what you write boils down to a few key ideas. 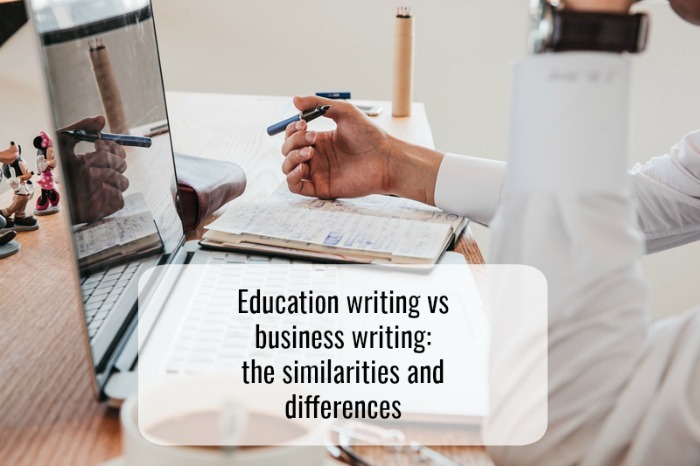 One of the distinct differences between writing for a business and writing for professors is the language of the writing. Typically, any writing for school assignments uses larger, more selective words. Whereas my work-related writing uses more commonly known words and phrases. The more scholarly the piece, the more likely the words included are longer and less-recognizable. Opposed to that, business writing is simpler, and straight to the point. When I look at how I write my papers for school versus how I write the assignments for Jamie’s Notebook, I noticed that the writing changes based on the audience. Whether you are trying to impress a professor or reach the audience of Northwest Arkansas, how you write and what you say will change. If the writing is trying to reach a more formal audience, the sentence structure and the tone will reflect that. However, if you are writing a blog post for a business website, the tone will reflect a more casual, yet informative tone. As any high school or college student will know, the main point of your paper is immediately clear. Typically, this statement is called the thesis, and it comes as close to the beginning of the paper as possible. The rest of the paper is focused on arguing or furthering that original idea. With business writing, it is less formal. The main idea of the writing post is stated or made clear, but it is not as set in stone where the main point has to be situated. Sure, business writing and writing for a professor have some differences. And sure, you will have to learn something new and challenging. So, while it may be difficult to learn a new style of writing, such as business writing, it is not as hard as you might think. It just takes a little bit of patience, the desire to adapt how you currently write, and it does not hurt to have someone there to help you learn (thanks, Jamie!). Shannon Farr is a 21-year old English Literature and Communications undergraduate at the University of Arkansas. At Jamie’s Notebook, she helps write blogs and newsletters, and also works on special, as-needed projects.